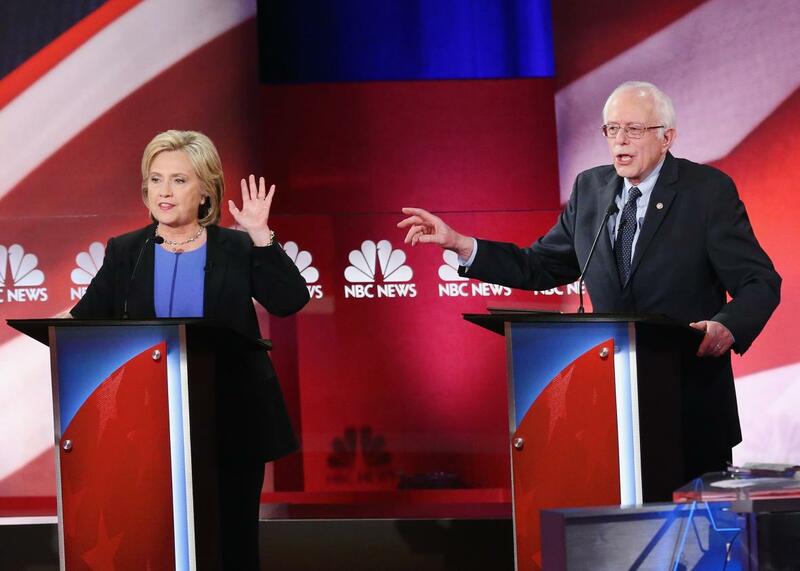 Democratic debate: what to expect from Hillary Clinton, Bernie Sanders. Hillary Clinton and Bernie Sanders participate in the Democratic Candidates Debate hosted by NBC News and YouTube on January 17, 2016 in Charleston, South Carolina. Surprise debate! Hillary Clinton and Bernie Sanders will square off on Thursday night for the first time since Clinton squeaked out the narrowest of victories in the Iowa caucus and only days before the New Hampshire primary, where Sanders looks poised to level the score in the states-won column. The MSNBC-hosted affair isn’t one of the six debates originally sanctioned by the Democratic National Committee—which you may have suspected, given it isn’t being buried in the middle of a holiday weekend—but was instead added to the official calendar by the DNC after the two candidates agreed to terms on Wednesday. Both candidates had good reason to sign off on the addition. Clinton is often at her best when she’s on the debate stage, a place where, in the words of my colleague Isaac Chotiner, she “combines her intelligence with a sincerity and level of conviction that often seem absent in other forums.” Hillary is hoping that a repeat performance on Thursday will give her some momentum heading into what is likely to be a very rough week and a half for her. Sanders’ rationale is equally straightforward: He’s been calling for additional debates since shortly after the DNC released its official schedule this past spring, and he’ll happily stand on equal footing with Clinton at another primetime event. (All the better for Bernie that the two will no longer have to share the stage with Martin O’Malley.) That Sanders will get to do so only days after he nearly battled Clinton to a draw in Iowa will only bolster the perception that he’s anything but the Phish Food-flavored afterthought that he began the campaign as. So, what to expect? The general themes are already well worn by now. Clinton will make the case that she’s the most qualified candidate to protect the progressive gains of the Obama administration, and to advance the cause with incremental victories made possible by her governmental know-how. She’ll look to counter the criticism that her brand of pragmatism prioritizes what’s achievable today at the expense of what might be achievable tomorrow. She’ll make sure to bill herself as the only thing standing in between an anti-Obamacare, anti-abortion, anti-science Republican and the White House. She’ll be ready to deflect any email-related questions if pressed by the moderators. And she’ll remind everyone she won Iowa. Sanders, meanwhile, will do his best to look like the true progressive on stage, contrasting his calls for things like universal healthcare and free college tuition with Clinton’s more modest proposals. He’ll try to rebut criticism that his ideas aren’t achievable given how partisan Washington and much of the nation has become. He’ll argue that he—and not Hillary—has the best chance in a general-election matchup with a Republican. He’ll do everything he can to stick to his inequality-themed script. And he’ll remind everyone he almost won Iowa. The biggest wrinkle is the timing of the debate. It’s taking place less than a week before the New Hampshire primary, and a little more than two before the Nevada caucus. Sanders will be looking to protect his New Hampshire lead; he knows that if he wins comfortably on Tuesday as expected, he’ll get to spend the 11 days between then and Nevada as the nominal leader in the delegate count (non-super-delegate division). He still wouldn’t be the favorite to win the nomination, but he very may well look like the favorite to those voters who begin paying attention for the first time at the same moment the talking heads begin wondering aloud whether Clinton’s doomed to relive her 2008 nightmare. Bernie won’t want to jeopardize that by going off script now. Hillary, though, might want to target her pitch not to the home crowd but instead at the out-of-state viewers watching in places like Nevada and South Carolina, where Team Clinton believes the more diverse and moderate electorates will serve as her electoral firewall. Her pitch wouldn’t change all that much if she is looking past next week, but it might give her a little more incentive to talk about immigration and systematic racism, or go harder after Bernie’s 2005 vote to shield gun makers and dealers from lawsuits. Going big on gun control again would come with its risks in New Hampshire—Sanders, after all, says he made his vote with small New England gun shops in mind—but given that she’s acting as though she’s written off New Hampshire already, Clinton doesn’t have much to lose. To that end, the Clinton camp has done everything it can to downplay her chances in New Hampshire, reminding anyone who will listen of Bernie’s near-native son status there and the electorate’s history of siding with fellow New Englanders when given the chance. (What you won’t hear her say, naturally, is that she managed to beat Barack Obama in the state back in 2008.) The latest polling suggests a come-from-behind victory on Tuesday would be something of a miracle for Clinton. She’s trailing Sanders by nearly 18 points in the RealClearPolitics rolling state average, and FiveThirtyEight’s models give her less than a 1-in-10 chance of winning the primary. Unless those polls are wildly off the mark, it’s hard to imagine her emerging from the Granite State with anything looking like a victory, electoral or otherwise. Barring a shockingly close finish, second place in New Hampshire will be seen as the first loser. Hillary knows that better than anyone. After all, by many accounts, her first-place finish in Iowa made her the caucus’s first loser.